EARLY REGISTRATION is encouraged. A list with hotels providing special prices will be send by the organisers following the registration. Gathering more than 250 scientists and industrialists as well as representatives of EU institutions and ministries from South and Eastern Europe, the event aims to raise awareness on the role of High Performance Computing (HPC) to transform Europe's digital future. Panelists will discuss the role of HPC in personalised medicine and in understanding the human brain as well as the link of HPC with other emerging computing paradigms, such as quantum computing. 14:10 to 14:25 Neural Networks - main pillars of machine learning. The registrations for Shaping Europe’s Digital Future - HPC for Extreme Scale Scientific and Industrial Applications HPC event in Sofia are now open. The registrations are open, free of charge and mandatory. On the dedicated page you can find the agenda and practical information. This space will be continuously updated, so please check it regularly. The event will also be streamed. The Human Brain Project (HBP) is a major driving force in the field of neuroscience research in Europe, aiming to model the brain and reproduce its complexity on computing platforms. At this event young researchers will have the chance to exchange information and knowledge with peers and HBP experts on tools for brain modelling, especially within the HBP research infrastructure supported by High Performance Computing (HPC) facilities. The event takes place at the Big Auditorium of the Bulgarian Academy of Sciences. Find the programme and registration info here. 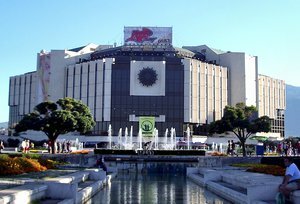 The National Palace of Culture in Sofia, Bulgaria.